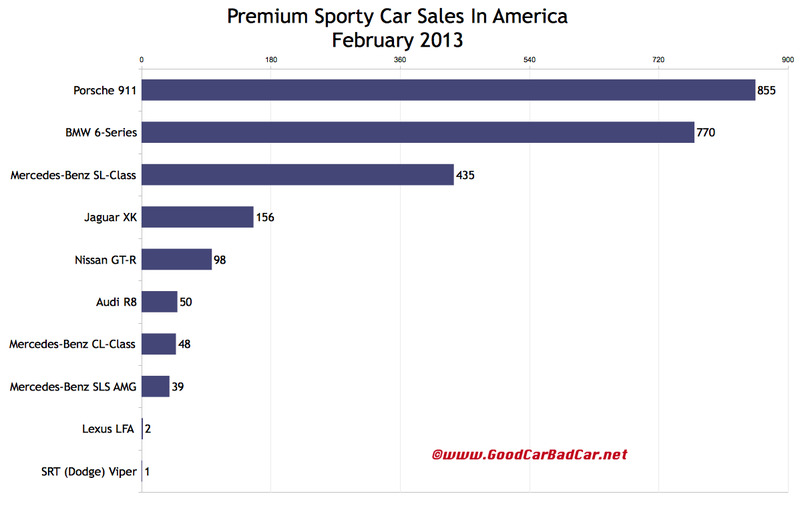 53% of Scion USA volume this year has come from FR-S and tC. I envision a sports car/hot hatch brand, free from misguided tall hatches. It’ll be the inexpensive Porsche alternative which, invariably, will eventually spawn a Cayenne-lite and quasi-Panamera shooting brake based on the Subaru Forester and the Legacy wagon that Subaru doesn’t sell here any longer. Some prophecies are certain to go unfulfilled. 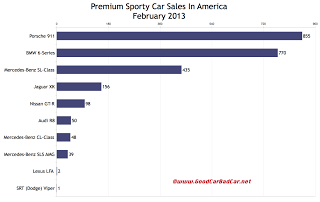 February 2013 sales of the Dodge Challenger reached record levels. 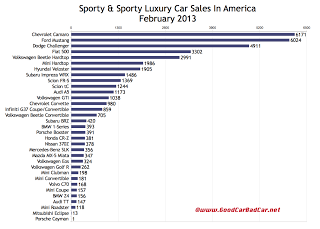 In the three-car American muscle family, 17,106 Camaros, Mustangs, and Challengers were sold in February. The Challenger ranked third in a class of three, this is true, but its share of that relatively large niche market rose to 28.7%, up from 20.5% in 2012 as a whole and 20.4% last February. Of the 1051 little German roadsters and coupes sold in America in 2013 – by which mean Audi TTs, BMW Z4s, Mercedes-Benz SLKs, and Porsche Boxsters and Caymans – 37.2% were Boxsters. 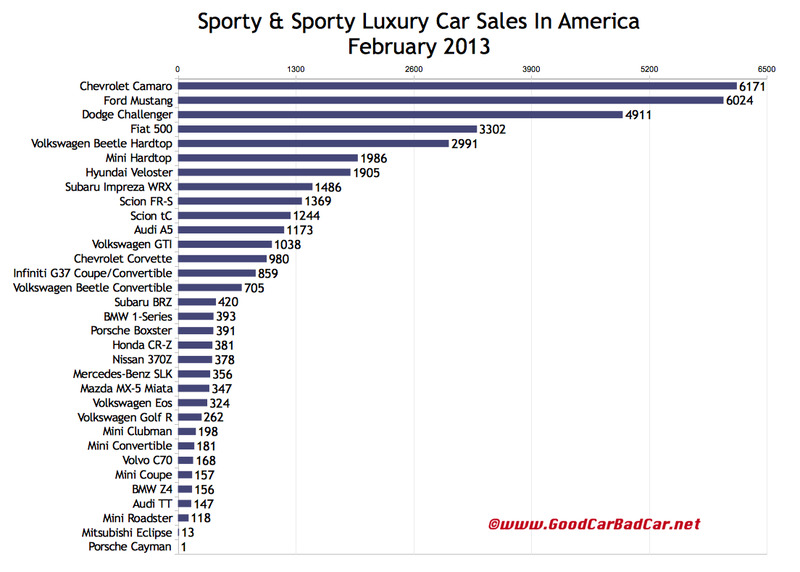 Indeed, the Boxster outsold the TT and Z4 (and Cayman, of course) combined. 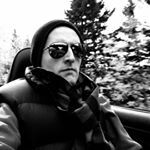 You can also frame the conversation this way: the Boxster and 911 accounted for 44.4% of Porsche USA sales in February – more than the Cayenne mustered – and 40.8% so far this year. Meanwhile, news out of VW HQ in Wolfsburg of the west, Herndon, Virginia, shows the GTI and R doing far less for the Volkswagen brand than they did a year ago. This is mostly the fault of the GTI reaching the end of its lifecycle. That said, sales of the Golf 2.5 and TDI rose 44% in February and are up 34% in the first two months of 2012. In February of last year, the GTI and R were responsible for 56.7% of total Golf family volume. That figure fell to 43% last month. Historical monthly and yearly sales figures for all these vehicles can be accessed by clicking a model name in the sortable tables below or by selecting a make and model at GCBC’s Sales Stats page. The tables below are now sortable, which should make it easier for you to see that Chevrolet sold more Camaros last month than Mitsubishi sold Eclipses.